Concrete—the most frequently used man-made substance consumed—is durable, versatile, and reliable, to say the least. Annually, 15 billion cubic meters of concrete is used. To put that number into perspective, if cement was soda pop, every American would have to consume about 343 million gallons of soda a year to approach how much cement we use each https://www.viagrasansordonnancefr.com/viagra-ou-cialis/ year. Currently, the average American consumes about 44 gallons of soda each year. Often, cement and concrete are considered the same substance, but these two materials are very different. Essentially, concrete is composed of cement. If you are not a part of the construction industry, the difference between the two may be insignificant to you, but concrete is essential to your way of life. From roads to high-rise buildings to structurally-sound homes to the Three Gorges Dam in China (the largest concrete structure in the world), concrete is used in a plethora of applications. it will not sink. With steel in shortages during World War I, concrete became a viable option and many nations made ships from concrete. Many nations used ferrocement, a light-weight alternative to concrete, to build their ships. With an abundance of concrete, many nations were able to continue expanding their fleets without the economic burden of purchasing steel. One of the greatest painters, sculptors, and designers of all times, Pablo Picasso understood the power of concrete. After meeting Norwegian painter, Carl Nesjar, who introduced him to betograve, Picasso created “Head of a Woman.” His love for betograve, concrete sculpturing, appealed to him so much that he partnered with Nesjar to create 24 breath-taking sculptors until he could no longer work. In fact, geologists, archeologists, and engineers have studied the concrete used by the Romans. They estimate that it is 10 times weaker than the concrete used today, but the Roman Pantheon and the Coliseum remain standing. The Roman Pantheon remains a mystery to many. Beyond the fact that the concrete remains virtually intact, the building is an architectural marvel. It is the world’s largest, unreinforced concrete dome. The height of the oculus and the diameter are the same. And, the builders didn’t include steel within the structure of the building. The fact that the Roman Pantheon stands strong for centuries speaks to how invaluable concrete is as a building material. With much stronger concrete than the Roman’s used, nowadays, you can create a fence or home that will last for centuries using concrete. The use of concrete dates back to the Egyptians, and many nations after them continued to use it. Over the years, there have been many changes affecting concrete. Truthfully, ancient concrete was often made by crushing limestone and creating a mortar, the substance is much different from the concrete you are familiar with today. Primarily, more substances have been added to the mixture to make it stronger. Nowadays, concrete is a mixture of cement, sand, stone, and water, which all come together to make the durable substance you’ve come to rely upon–to the extent that you may not notice how much you depend on concrete. 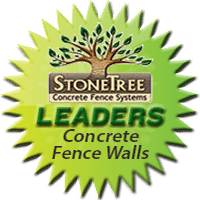 Now, you can incorporate this long-lasting, highly-durable, material into your landscape with a precast concrete fence or wall from StoneTree ® Fence. We have manufacturers all across the world, and our patented dual forming system will save you time and money. Contact us for a Hassle-Free Fence Wall Quote today.